Today was our final class. It was a great ending to a fun course. The wind cooperated and stayed in a range we could actually throw in. We started by heading across the parking lot to an almost open field. Well, open except for a number of small trees scattered all around. These trees are boomerang magnets. 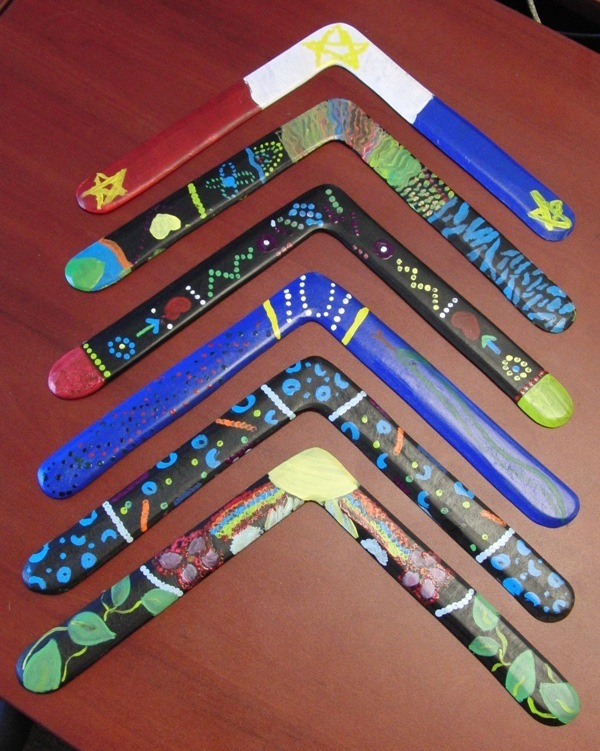 Here are the student’s boomerangs. 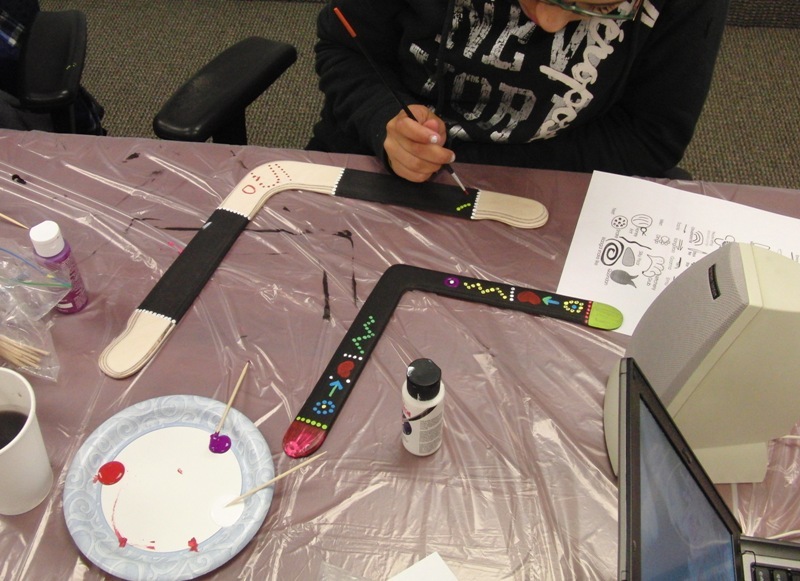 The students had the boomerangs they made. I grabbed a boomerang of my office wall, a Sleek by Bruce Bernstein, to demonstrate with. I made one throw to show the students and promptly hung the Sleek in one of the trees. Since the trees are smaller, Hector managed to get the boomerang back. The students started to make their throws. It took a few throws but most had the basic throw going pretty well. We had to watch for the amount of layover some of them used. 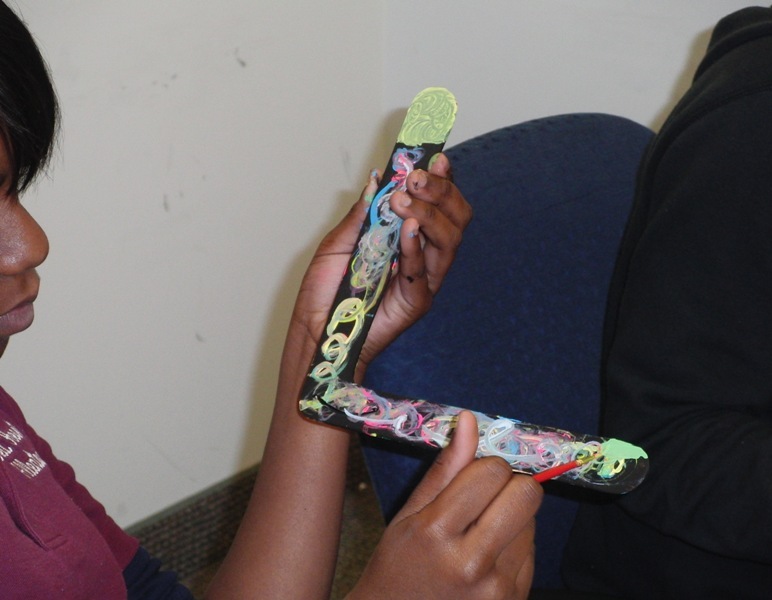 One girl’s boomerang needed some tuning so I tuned it and showed her how, and explained why it needed it. Her throws improved after the boomerang was tuned. We went back inside to continue our class and wrap things up. using a laptop and a projector, we hit the internet and watch a few videos of Dreamtime stories, as told by Aboriginal storytellers. The students liked the storytellers and actually had questions after the storys. Nice to know they were listening. 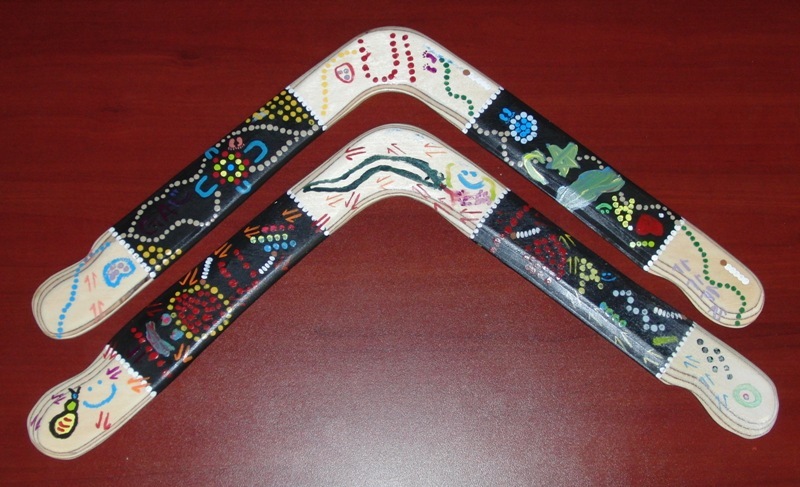 Also the students and teachers signed the two larger boomerangs whch will be retained by the teachers. 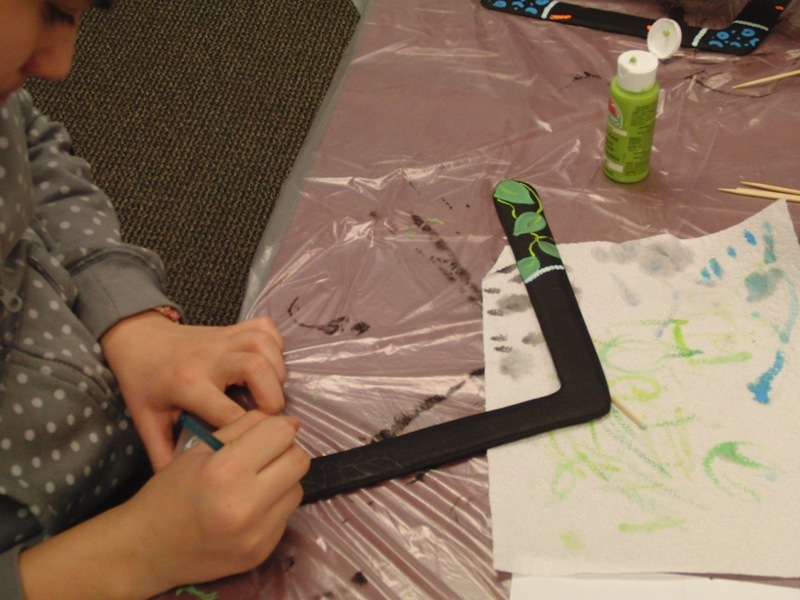 Everyone in the class , including the teachers, had a hand in decorating thos boomerangs. Here’s a photo. We also did a word search puzzle and had to find Australian animal names. To finish up, Hector passed out a feedback form to the students. We wanted to know what was good and bad about the class and what comments they had. Of cousre we, as the teachers, thought the students were terrific but wanted to know if we had performed ok. It was gratifying to read some of the comments like: ‘I will recommend this class to my friends”, “Thanks for everything, We loved the class and really appreciate it”, Thanks for everything. Best teachers.” and “I want to be in this class again”. You can’t imagine how good that feels to read those words. We gathered for a group photo before ending the session. I know that the teachers are sad that it’s over and got the impression that the students are too. Hector coined a phrase about the xcalss, which was originally going to be just about boomerangs. He said: “Changing lives, one throw at a time”. After today’s class, it seemed to be fitting. Australia Class week 7: Boomerangs! After a week off we returned to class today. 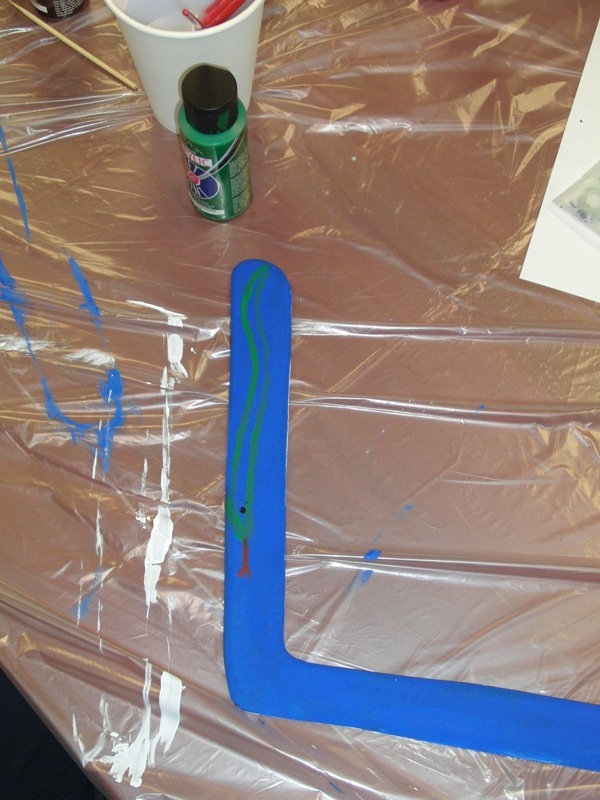 Two weeks ago we shapped boomerangs, adding the airfoils and sanding them smooth. I touched them up a bit during the break, tested them and stained them walnut. 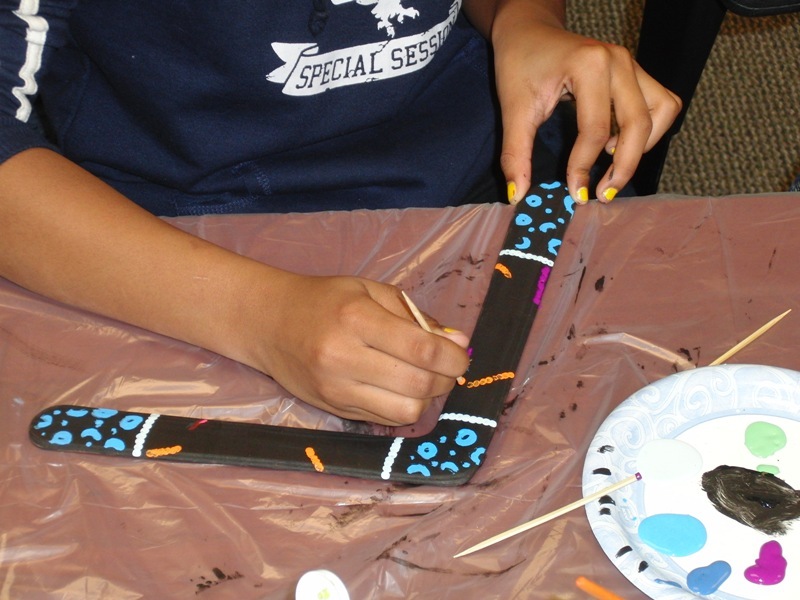 Today the students took over with acrylic paints to finish the job. 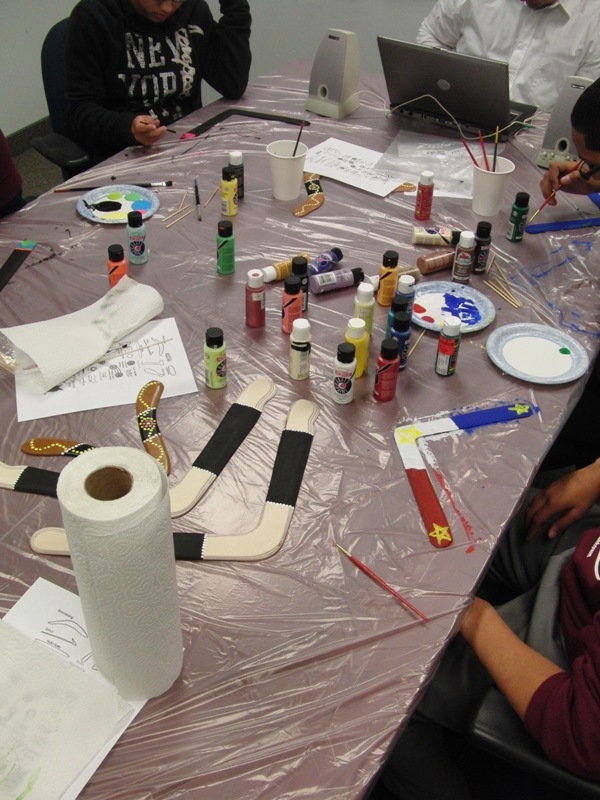 It quickly became evident that they had their own ideas on how to paint them. It’s good we covered the table with a plastic drop cloth. Next week is our final class. I’ll be taking home the boomerangs today and giving them several coats of clear finish over the weekend. The students can take their boomerangs home next week. We still need to figure out how to end the class.